The following checklists are intended to guide developers on the implementation of success criterion for maps. The checklists should be used during the development phase to ensure WCAG 2.0 compliance of all maps on the site and should form part of the unit testing phase undergone by developers when updating or creating new content or functionality.More detailed information on accessible map long descriptions and the implementation of Google maps can be found in the appendices. Maps can be accessed by the keyboard. Accessible alternatives have equivalent content. A link to the accessible alternative is provided (e.g. flash map). Content displays correctly (no overlapping, repeating or stray bullet points). Additional text or functionality does not appear. iFrames have a text alternative. All image maps are client-side (not server-side). All images and image map areas have an ALT attribute. ALT=".." MUST BE present. ALT attribute accurately describes the map image (or areas) or conveys its purpose. If the map image (or areas) is not complex the ALT should be shortened if possible. A long description is provided for complex map images or image map areas. A long description of the map should be a part of the page content. The long description (or a link to it) is near the map. The long description is referred to in the ALT. The long description must be equivalent to the map. Changes occur only after focus (e.g. not only on mouse hover). Colour or shading alone are not been used to convey information in the map. Shape alone has not been used to convey information in the map. The map text size can be increased without losing functionality. Sufficient colour contrast is used between the foreground and background. Maps have a visible keyboard indicator. The developer checklist tables above should be used during the development phase to ensure level AA compliance of all maps on the site and should form part of the unit testing phase undergone by developers when updating or creating new content or functionality. Describe only those aspects of the map that are relevant, e.g. the most important point or the most common feature of the map, or bordering . Describe the distance (in kilometres or metres) from important points. If the map will be used for transport, give directions for car, public transport and/or walking. If the map is time-sensitive, mark the times in the long description. If the map is a transport map, organise the map by train, bus or train line and describe the locations and distances travelled. If the map is a topographical map, mark the height at which important points occur. 4.25pm Storm (strong) approaching east over Williamstown, eight kilometres in diameter. 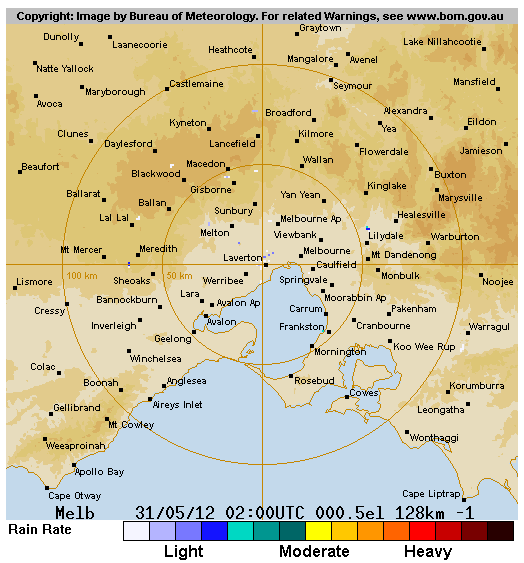 Light rain over Melbourne city, four kilometres in diameter. 4.40pm Storm (strong) ten kilometres west of Melbourne city. Light rain over Clayton, four kilometres in diameter. 4.55pm Storm (strong) over Melbourne city, eight kilometres in diameter. Rain (strong) over Richmond. 5.10pm Storm (extreme) over inner city East Melbourne, ten kilometres in diameter. The following is a long description of a map showing the average daily mean temperature in July. This map divides the agricultural area of the prairies into 5 distinct zones in regards to average July temperatures. Temperatures in Manitoba are 19 to 20 degrees in the south and 18 to 18.9 in the north. 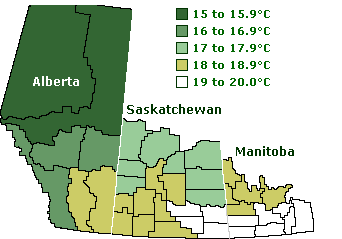 Saskatchewan is 19 to 20 in the southeast, 18 to 18.9 in the southwest, and 17 to 17.9 in the north. Alberta ranges from 18 to 18.9 in the south, 16 to 16.9 in the centre, and 15 to 15.9 in the north. Source: Canadian Grain Commission. 2012. Long description of a map showing the average daily mean temperature in July. [ONLINE] Available at: http://www.grainscanada.gc.ca/str-rst/fusarium/ldt-ldt-eng.htm. [Accessed 31 May 2012]. These documents were funded by the Australian Bureau of Meteorology and are licensed under the Creative Commons Attribution Non-commercial license. We are an accessibility consultancy with offices in Australia and the United States. We test websites, mobile sites and applications. We work with small and large organisations and Government departments to meet their accessibility obligations.